Character. Cost: 6. STR: 3. You cannot win the game. 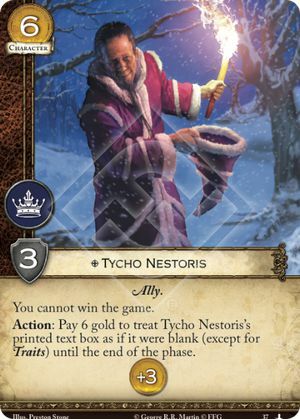 Action: Pay 6 gold to treat Tycho Nestoris’s printed text box as if it were blank (except for Traits) until the end of the phase. The March on Winterfell #37. If you reach 15 power, you may continue accruing power as normal, you simply cannot win the game unless you blank Tycho Nestoris or he leaves play. If a tournament game goes to time with a player controlling Tycho at 15 power, that player’s opponent receives a modified win, as that opponent is considered to be closer to their victory condition. If a tournament game goes to time with both players controlling Tycho, both players receive a loss. If a player controls Tycho at the end of a Melee game, the best placement that player can achieve is 2nd place. If a tournament Melee game goes to time and a player controlling Tycho has the highest power total, the player with the next-highest power total is the winner of the game. Tycho does not prevent a player from winning if that player’s opponent concedes the game.